Will Zhou Xun (周迅) and Jay Chou (周杰伦) collaborate together? 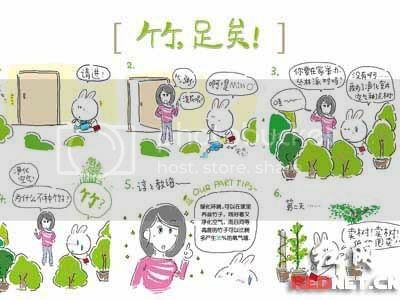 This hasn't been confirmed yet, but Zhou Xun already has another 'Zhou-Zhou' (周粥) collaboration - with a fat rabbit, Zhou Zhou (粥粥), in a comic that promotes environmental awareness. Zhou Xun acted as the UNDP Goodwill Ambassador for China, and she was responsible for introducing the theme 'Our Part'. In the 'Your Illustrated Home' paper, she introduced her comic column, continuing this serial for a year to promote environmental awareness. 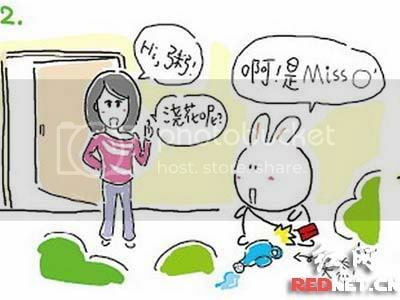 The first comic is written by a cartoonist, fat rabbit 'Zhou Zhou' whom is currently very popular in the country. Different stories are brought about with the adorable rabbit, and 'Miss O' in the comic is modeled after Zhou Xun. 'Zhou Zhou' will be drawing six comics for Zhou Xun, and in the future there will be other artists joining in. Hence Zhou Xun named her set of comics as 'Our Part Tips All Star', using the idea of a 'full star', calling for more people to join in. Zhou Xun expressed that recently, cartoonists have enjoyed the support of youths. If they could promote environmental awareness in a comic setting, maybe it will influence more people to become 'green'. When choosing cartoonists, even though many people introduced foreign cartoonists to her, she still insisted on finding young cartoonists within the country to work with, whom are full of vitality. She hopes that this arrangement would enable her to work with young cartoonists whom already have the power to influence. This also tallies with the slogan 'Our Contribution', with everyone having the chance to contribute. Fat rabbit 'Zhou Zhou' whom helped Zhou Xun draw the comics is also a 'live music pioneer'. In 2007, he was chosen as 'China's Music & Family Role Model'. After hearing about Zhou Xun's designs, he immediately agreed to join in. He laughed aying: "Because my whole family are fans of Zhou Xun, so of course I must join." He revealed that the character 'Miss O' is modeled after Zhou Xun's special features. He said that in fact, modelling a character after a real person is very hard, hence he tried using Zhou Xun's big eyes, and the hairstyle of hers that everyone usually sees to create the comic character Zhou Xun. The collaboration between Zhou Xun and 'Zhou Zhou' could be said as the first 'Double Zhou' collaboration. However, in the 'Ci Ling' press conference, Jay Chou expressed his hopes to work with Zhou Xun. This is another 'Double Zhou' collaboration that is worth anticipating. Zhou Xun expressed that she has always admired Jay, and while they were filming his 'Besieged on all sides' MV, she noticed that Jay put many of his own creations in the MV - he is another young person with lots of talent. Though the two of them acted in 'Beggar So', they didn't have scenes together. If there is opportunities to work together in the future, she hopes that they would.